By his count, Georges Awaad can carry on a conversation in 16 languages including his native tongue French, as well as Arabic, Spanish, Mandarin and Swedish. 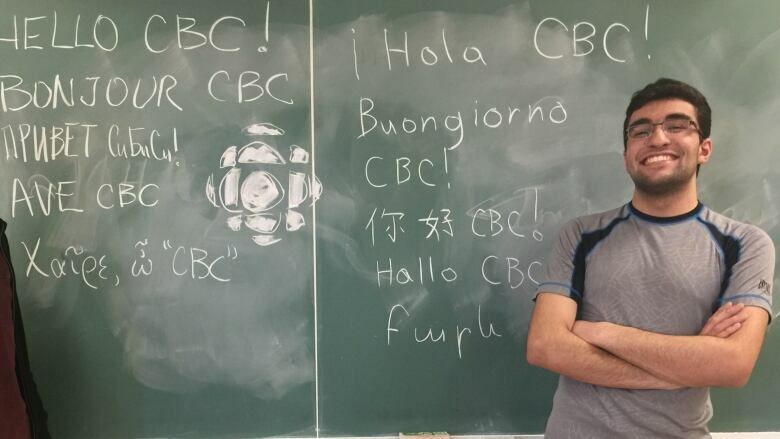 Georges Awaad might speak more languages than any other teenager in Canada. By his count, the Montreal teenager can carry on a conversation in 16 languages including his native tongue French, as well as Arabic, Spanish, Mandarin and Swedish. And he's not stopping there. Next he hopes to learn an Indigenous language such as Ojibway or Inuktitut. ​Awaad, 17, teaches himself the basics using online tools such as Google Translate and YouTube tutorials. He commits to spending time every day immersed in the languages he's learning. Awaad says he got hooked on languages when he was eleven. He decided he wanted to learn to read Arabic, so he could better understand the news programs he watched with his grandparents. They started to teach him the alphabet and how to read and write in Arabic. "I told my mom and dad that I loved it and they said, 'You can try other languages too. Maybe you'll like it.' he recalls. "I went and explored and I fell in love." Georges Awaad, 17, can speak 16 languages, including French, Arabic and Mandarin. (Shea Shackelford)Georges' father, Elie Awaad, is from Egypt. "I remember the first time I showed him Google Translate, it was like Disneyland for him." Awaad's efforts to master multiple languages have changed the way he sees the world. "It's like learning to decode other ways of speaking and seeing the world." He says his passion for other languages has also changed his personality. Awaad says he used to be very shy. "But then I started to learn new languages, and at one point when you learn, you start to get to the point where you want to actually use it with people." For example, Awaad discovered his schoolmate George is a native Russian speaker. Now they talk all the time. "Georges is reading news in Russian, or text and books," says George Yeryomin. "So we have more things to discuss about Russian culture. It gets us a little bit closer together, so that's an advantage and asset having a friendship like that." Awaad's list of languages to tackle next include Thai and perhaps an endangered African language. "I want to learn as many as I can, until I die." 1. Start online, with tools such as Google Translate, language websites, YouTube tutorials, or podcasts that teach the basics. 2. Go beyond grammar tables and conjugation charts. Don't just memorize rules, try to apply them in sentences. 3. Stay immersed in the language you're learning every day, even if it's just for 15 or 20 minutes. 4. Challenge yourself to do everyday tasks in another language. For example, look up a recipe or write a shopping list. Switch your smartphone or Facebook settings or listen to music in another language. 5. Find someone you can speak the language with, and have fun!